All parts for these variations are delivered with this model. High quality single needle zig zag sewing machine. Special horizontal axis rotary hook. Will sew medium to heavy materials. Working Space 265mm Length X 128mm Depth. Two step max 12mm zig zag width. Can be easily locked into left centre Right sewing mode. Machine speed a very respectable 2200 spm. Top Feed a Inner & Outer Foot to lift the sewing machine on & off seams. Reverse with optional pneumatic activation. Pneumatic 15mm presser-foot lift is available as an option. Global BT series pattern sewers are well built and reliable, with easy to use touch screen panel, with clever innovations. 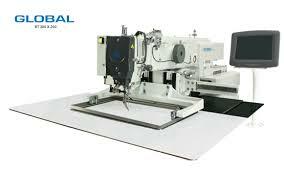 This programmable pattern sewing machine is suitable to sew medium / heavy materials with a sewing area of 100 x 100 mm. The height of presser foot lifter can be adjusted by a stepping motor. Patterns are programmable on the userfriendly touch panel. The left and right clamp can be programmed to move down independently. The main difference between the ZZ 1560 Series and ZZ 1567-75 Series is the latter has 750mm under arm clearance, large hook type and base with large bobbins, and a 10mm stitch width. Computer controlled, high speed bartacking machine. Global Bartack machine is driven by a direct drive Ho Hsing AC servomotor and is suitable to sew medium/heavy materials. Global Bartack machine has a multi-axis controller from Ho Hsing; reliable, effective and economical. 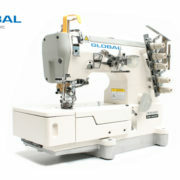 Global Bartack BT-2900-H standard delivered with 47 stitch patterns. The clamp set supplied with the machine is suitable to sew 24 stitch patterns. This programmable pattern sewing machine is suitable to sew medium / heavy materials with a sewing area of 300 x 200 mm. Special horizontal Large Capacity axis rotary hook. Two step max 10mm zig zag width. Machine speed a very respectable 3400 spm. For a cylinder arm an impressive 12mm stitch length. 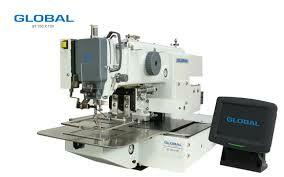 If you are sewing heavy cylindrical work, this is the machine for you at the right price. Thick webbing harness work, Sail making, tarpaulins fixing straps, etc…. Extra heavy duty programmable pattern sewer with large shuttle hook and bobbin capacity. 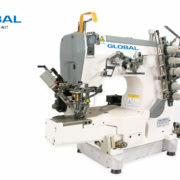 This machine is equipped with automatic thread burners to trim upper and lower thread. The machine is standard with needle cooling device. 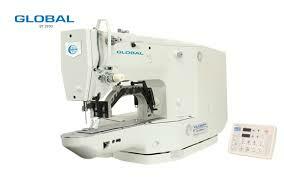 This machine is suitable to sew extra heavy materials, such as safety belts, flight cases, cargo straps and luggage. The machine can easily be converted into a rope sewing machine. Cam Controlled will sew 2 step, & 4 step / 3 stitch. Plugs Leads Sockets, Steam Hoses.